We highly recommend East West Street: on the Origins of “Genocide” and “Crimes Against Humanity” (Knopf, 2016), by Philippe Sands. Part biography, part history, it relates the fascinating beginnings of the use of these terms in the period prior to, and subsequent to, the Second World War. Prof. Sands’ grandfather came from Lemberg, Poland and he weaves his personal history into the intellectual life of the city which was home to Hersch Lauterpacht and Rafael Lemkin. 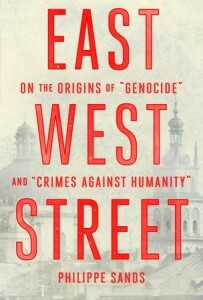 He traces his own background (the mystery of how his mother as a baby was sent to Paris, the loss of many family members), as well as painting a vivid portrait of the struggles that Lemkin (who first used the phrase “genocide”) and Lauterpacht, who believed that the individual had rights vis a vis the state, suffered. He also meets the son of Hans Frank, who was the Governor-General of German-occupied Poland, who has his own demons to deal with. The search for answers to Sands’ own backstory reads like a real-life mystery story. He persisted for years to locate survivors from the tumultuous times during and after the war. The role of the elusive Miss Tilney, the frightening rail journeys through Europe, the ever-changing boundaries of states as they were annexed, all combine to paint a confused picture of life in Europe at that time. Many of the incidents Sands relates have had repercussions down to the present day. It’s a disturbing look at how nations have treated their own citizens and what people had to do to survive war and racial hatred.